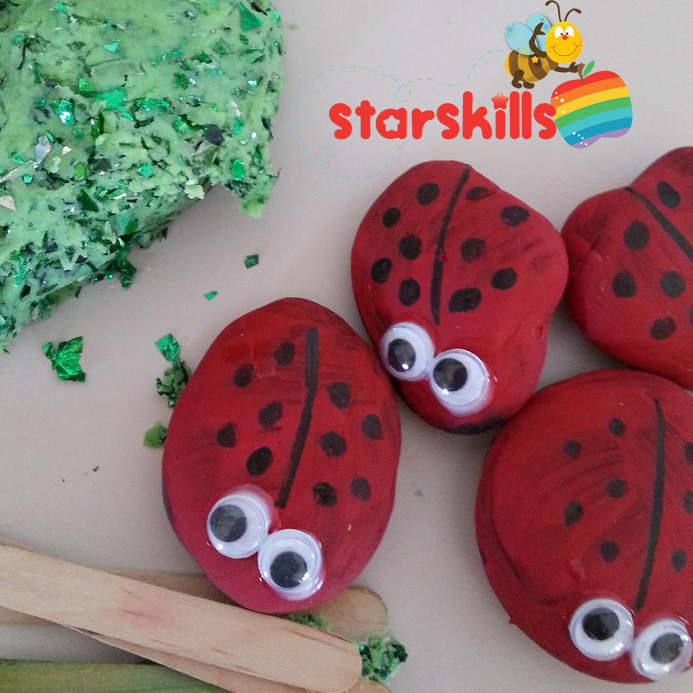 We made these cute ladybugs and then added them to our Insect Sensory play for the week. Included in the play was glitter green play dough for the grass and pop sticks. I mentioned to the children that you can tell if a bug is an insect as it has 6 legs a head, thorax and abdomen. The children instinctively used the pop sticks to create their own play dough insects. We had also read The Ten Ladybugs and the children were counting as they played. It helped to read the story and provide the scientific information right before play. You are setting up the play in your prior learning or mat sessions. With this in mind it is important to be decisive in what things you want your children to learn. Children LOVE to learn. As educators we provide information and then offer materials that will allow children to practice and imitate what they have learnt. Children will use their memory but as educators we can also give reminders to guide and help children. In this case at the play dough table you could ask the children to count legs on their insect. Ask them how they know their play dough insect is actually an insect and not a spider. Ask the children to count.